Previous Post: « 10 Books I Didn’t Read in 2016 Because I Get Distracted Easily By — OH LOOK A SQUIRREL!! Gloriously mysterious!! And there are so many interesting theories and movies and retellings ahhhh. IT’S THE BEST. Hugs and kisses from the tiny little bean of land called The Netherlands! You are MOST welcome for me getting the song stuck in your head.😂 Honestly i’ve been mentally singing it on repeat for like, um, all afternoon while I got this post ready. BUT NO REGRETS BECAUSE IT IS A SONG OF GLORY. I really want to read this book! I’ve seen the Phantom movie but not the musical on stage. I’ll totally sing some songs from the movie soundtrack though if that’ll get me a copy of the book, although my singing is probably more likely to make you run in the other direction, haha. I also plan to read the original book since I like to read originals before retellings, and I need to read more classics anyway 😛 But man, I would love a Jekyll & Hyde and/or Dracula retelling! Those are two of the few classics I have read lol, and J&H has so much potential. My singing can probably be summed up that way too.😂 I used to just volunteer to play the piano (badly) while my little sister sang. aHHH OUR FABULOUS CHILDHOOD. Good times.😂 And I’d like to read the original too someday! I’m super scared of classics but I love this one enough to risk it heheh. I think I read the book when I was a lot younger! It seriously creeped me out though. 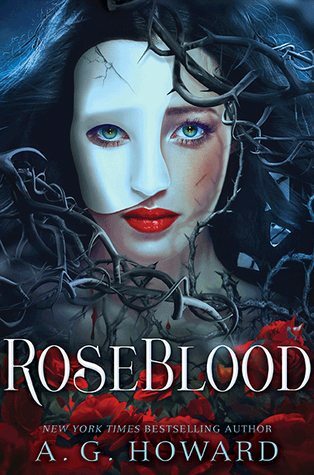 I’m so excited for Roseblood, even though I haven’t read any other of her books. I’ve heard so much about them though, maybe I’m going to become a convert? I was lucky to see Phantom of the Opera in NYC and my mum got tickets very close to the stage. It was one of the most beautiful things I’ve ever seen in my life. The soundtrack is amazing, whichever edition you’re listening to. The movie was good, too. Christine was never my favorite character, though. Eric, eccentric as he is, is still a great character. I’m curious how Roseblood is going to handle the story in a modern setting. I haven’t read the Splintered series, so I’m not familiar with A.G.’s style. Oooh, this would be a glorious introduction! But honestly I’m a rabid fan here and am going to insist you read Splintered at some point too. Because MORPHEUS. I do have the first book in the series around here somewhere. I remember picking it up because a.) Alice in Wonderland inspired for the win! and b.) the books have different colored inks for each one. That’s insanely unique! Have you read the book she mentioned, Phantom by Susan Kay? I got it years ago for Christmas and it gives a very interesting look at Erik’s background. I think you’d like it because it’s got a lot of crazy background goings-on. I haven’t read Phantom by Susan Kay actually. I hadn’t heard of it till recently! I did read Of Metal and Wishes by Sarah Fine which was a POTO retelling but set in a fantasy Asian inspired world in a Slaughter House!?? It wasn’t my favourite.😂 I need music!! Weird. O.o I’m not sure how to feel about that. It definitely is different than any other retelling I’ve ever heard of before! Bless you for making this international! And for reminding me that I should watch the Phantom of the Opera again. You’re welcome!! 😂 INT giveaways are the best! ;D And I’ve reminded myself I should rewatch POTO again too! I have seen the old Lon Chaney movie several times, but not the modern movie or play. I have read a couple of retellings. My favourite is Terry Pratchetts, ‘Maskerade’. It now strikes me that this 1925 movie will soon be one hundred years old. It definately stands the test of time. So my exposure to Phantom of the Opera consists of reading an abridged version when I was younger, and (more recently) obsessing over Peter Hollens’ Phantom of the Opera medley because it fits so WELL with a story I want to write someday. But Roseblood does sound very cool, so maybe I’ll pick it up anyway if I have time and can get my hands on it. Also, FYI: your Goodreads link is a bit broken. Scratch iPhone 6- IPHONE 7 GET OUTTA MY WAY. I don’t even know what’s the latest things.😂 I don’t like phones. I don’t either- I don’t have one- but when everyone around you who’s your age or younger has a phone, you get to know about this sort of stuff. E.g. right now with me there are 6 phones in this room belonging to 4 people. I KNOW SIX YEAR OLDS WHO HAVE TABLETS AND PHONES. The world has been invaded by technology. IT’S A CONSPIRACY WE’RE ALL GONNA DIE. Agh, yes, a 6 year old with their own phone/ipad/whatever isn’t right.🙈🙊 I didn’t even get an ipod until I was like 17.😂 WE’RE DEFINITELY ALL GONNA DIE. BTW, this is in a third world country. Just saying. Okay, I didn’t know where you lived. And everyone around you has their own multiple phones and things even when they’re young? That’s very different to where I live in Australia I guess! TBH, I think Australia is better? I mean, it’s kind of worrying to see kids on screens 24/7. Part of the reason, I think, is because mothers can’t really properly take care of their children and just dump screens on them to keep them occupied. It’s sad. Family relationships are ridiculously twisted and warped where I live. Oooooh, this looks fabulous! Phantom is essentially the only musical I like. I used to play the theme song in orchestra and always got chills. YES. The songs always give me chills too!! And I’m the same, because I don’t love many musicals but I loooooove this one so much. Ahhhh I’m so glad you love Splintered too! And omg isn’t Anita just the loveliest of ever?!? I shall read it because I love the way you review?! I mean?! The flail?!?! And the fangirling?!! Yes! I literally was a like “VIOLIN!! !” Do you play???? YES YES I DID USE TO PLAY! I swapped to the cello though a few years back and now I don’t really play anything.😂 Do you play? 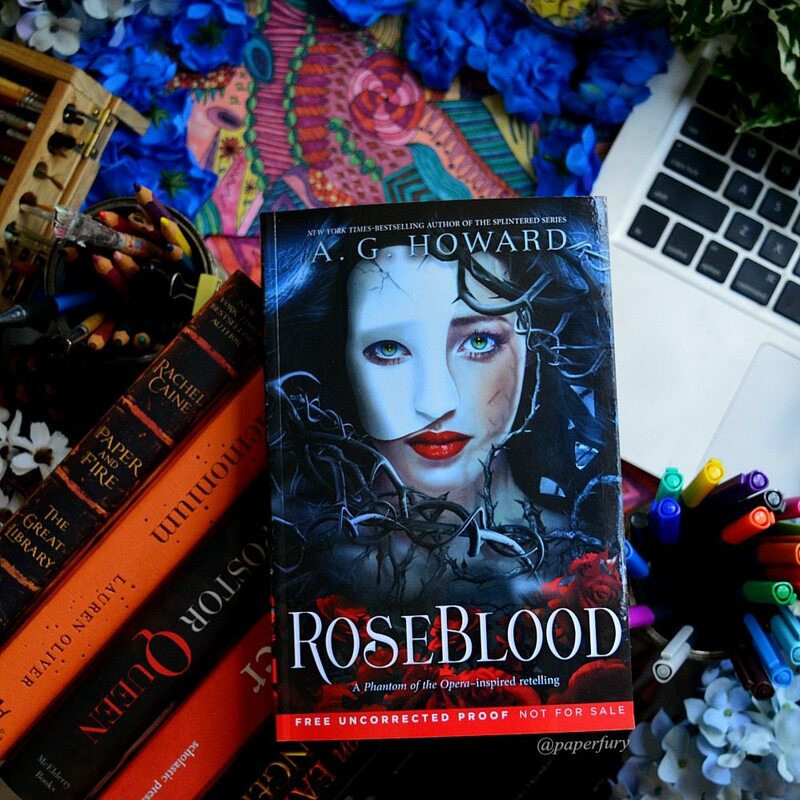 I haven’t seen any Phantom musicals as of today (shame on me) (hides in the corner) so that’s why I am sooooooooooo excited to read RoseBlood! And it’s by A.G. Howard so I am definitely gonna check it out immediately!!! Pfft, no one is every calm on this blog SO BE AS WILDLY ENTHUSIASTIC AS YOU WANT. YOU’RE IN GOOD COMPANY.😂 And definitely have a good feeling because I can 500% attest to it being glorious. caith is book MAMA OF EVIL! I mean, I am excited because I have never read this author or the pantom of the opera itself. So I am in! I really loved this one. It definitely has that Phantom of the Opera vibe to it. This will most likely be a re-read for me at some point. I’m glad you got to interview A.G. Howard too. That is really cool!! I’m looking forward to seeing what she does next. Yaaas a perfectly fantastic Phantom vibe. I’m so endlessly happy with it. *flails around this epic book* AG Howard is so so lovely too!! Guess what’s really strange — I read Splintered, but had NO idea there were sequels until I saw them in one of your posts, because my local library does not carry them. Imagine! And I am aware of all the musical issues/flailing surrounding the original Phantom (my mother had a mild obsession with a few musicals years ago, and Phantom was one). I think I’m due for a rewatch on the movie! I’ve even seen the musical on Broadway which was an AMAZING experience!! I can’t wait to see how this novel goes – I’m way down the wait list at my local library. Thanks for the giveaway, Cait! Ooh that’s so cool you’ve seen it live! LUCKY.🎉🎉 And I hope your reserve comes in really soon, eeep. I LOVE Phantom and I am so excited for RoseBlood!!!!! I was hoping you would love it and that it would be amazing! While I have not seen Andrew Lloyd Webber’s Phantom of the Opera live and in person, I have seen another version simply called Phantom. I also have the full cast recording (ALW version), the book that includes the full libretto, the movie version, the original book and…. anything else phantom I have been able to find. What an amazing giveaway! This is a book that I have been highly anticipating because of its connection to Phantom of the Opera. By far one of my favourite musicals and books (Gaston Leroux wrote such a gripping story) and seeing it on broadway is high on my bucket list too! Thank you for hosting this giveaway! I still need to read the original omg BUT I WILL DO THAT SOON!! And I love the movie so much, but it would be amazing to see it love too! You want to know what is insanely creepy?? I had a dream last night that I went to Disneyland and met Gerald Butler. I kid you not- it happened. And then I woke up to this- it must be a sign! I need to read this book. Now. I read Gaston Leroux’s Phantom of the Opera way back in middle school. Since then I’ve been interested on how others put a spin on such memorable story. Excited to read this one! I still need to read the actual original instead of just reading all the retellings and watching the movies bahaha.😂 And in middle school?! That must’ve been tough reading! I Know very little about the Phantom Of the Opera story, but I still enjoyed the book immensely. I love the relationship between Rune and Thorn and the supernatural aspect of the story. I also loved her Splinter stories. I would love to see her rework Midsummers Night Dream or Jekyll and Hyde. But I’m sure anything she chose would be amazing. I have never seen Phantom of the Opera, but I must say, I was completely and utterly dazzled by the 25th anniversary production with Sierra Bogress and Ramin Karimloo that came out a few years ago… Everyone in that one was just great, and I think they brought a lot of new interpretations and ideas to the stage… <3 I love that. This seems like such an interesting book to read! I know that I've wanted to read Phantom of the Opera-type stuff before, but secretly I didn't like the original Phantom of the Opera book very much, so I am more hopeful for this one. My sister was in Phantom when she was in high school and I took pictures during all 8 performances. It was pretty amazing. Also I may have had a slight obsession in high school and watched it everyday while getting ready for several months lol. When I came across this book I got super excited! I’m a huge theatre nerd and I think more musicals need retellings. New books like Roseblood not the stories/plays that some are already based on. For example a new version of My Fair Lady or Pygmalion could be an awesome retelling! Ooh, that IS completely awesome!! And I’m glad we both had a completely-obsessed-with-the-Phantom-of-the-Opera stages in highschool.😂 I hadn’t even THOUGHT much about musical retellings until this!?? Now I’m 100% for them and we need so many more. Eeep! Eeee, I am SO excited to read this!!! But I’m holding out – I got tickets to see The Phantom of the Opera for Christmas, and I don’t really know the story, so as this a sequel-esque story, I’m waiting until I see the musical before reading it. BUT I AM EXCITED FOR BOTH!!! Also, my bookish Secret Santa got me a copy of Splintered for Christmas! I’m not really a fan of Alice in Wonderland, but I’ve heard such great things about the series, I’m looking forward to giving it a go. So I have both books waiting for me to read! And YAS a think a gothic B&B would be beyond amazing. (I also really want that Dracula now.😂) And I do love how AG Howard does modernise them, because it allows for so many epic twists!! The first broadway show I ever say in NYC was Phantom of the Opera. I already loved the story from watching the movie (obsessively I must add) but seeing the show in NYC? AMAZING! WOooow this book sounds amazing, and looks amazing. 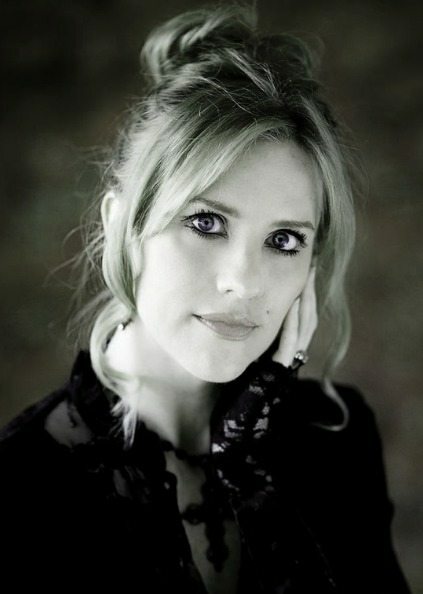 It’s really interesting to read about author’s creative processes. Hopefully I get to pick it up soon. I always love the behind-the-scenes looks at authors’ processes! IT’S SO COOL. And yesss, I hope you get to read it soon too! And yep that’s a definite rough outline of Phantom of the Opera!😂 It’s a lot more complicated though with the Phantom’s backstory/motives, although he is totally creepy, I will not deny. I really want to read the original book though, because I haven’t yet. Although classics terrify me??? BUT I’LL BE BRAVE. Such a fantastic book! I love how dark and Gothic it is and the characters and the music and the mystery and the supernatural element and everything!! Yaaaas I’m so glad we both loved it!! *hi fives* It had such an epically creepy spin to it and I adore that! I’M SO FREAKING EXCITED ABOUT THIS but at the same time I kind of forgot it was coming out? HELP I HAVE A HORRIBLE MEMORY. But seriously, that book is gorgeous. I’m actually considering buying one of those blank white masks so I can do a photo with it once I get this book because clearly all I think about it bookstagram these days. Although, I’ve never read/seen the original Phantom of the Opera. WHICH IS AWFUL, I KNOW. Eeep, I hope you get a chance to read it someday!! I love phantom of the opera! Have seen the musical on stage several times and I saw the sequel Love Never Dies (which wasn’t quite as good) loved the Alice ones so hoping this is as good. Can’t wait for my birthday, hope this is among my gifts. My sister told me to avoid the sequel.😂 Hehe. But I’m kind of curious?! And I REALLY want to read the original book too, because I’m a bit ashamed of how passionately I love this series but I haven’t read the actual original yet! I CANNOT WAITTTT TO READ THIS. I love Phantom of the Opera! I’ve watched the movie version and I LOVED IT. And also, in like year 8 one of the girls in my class sang the main Phantom theme (with the ridiculous high notes) and I’m still scarred because it was…not great. 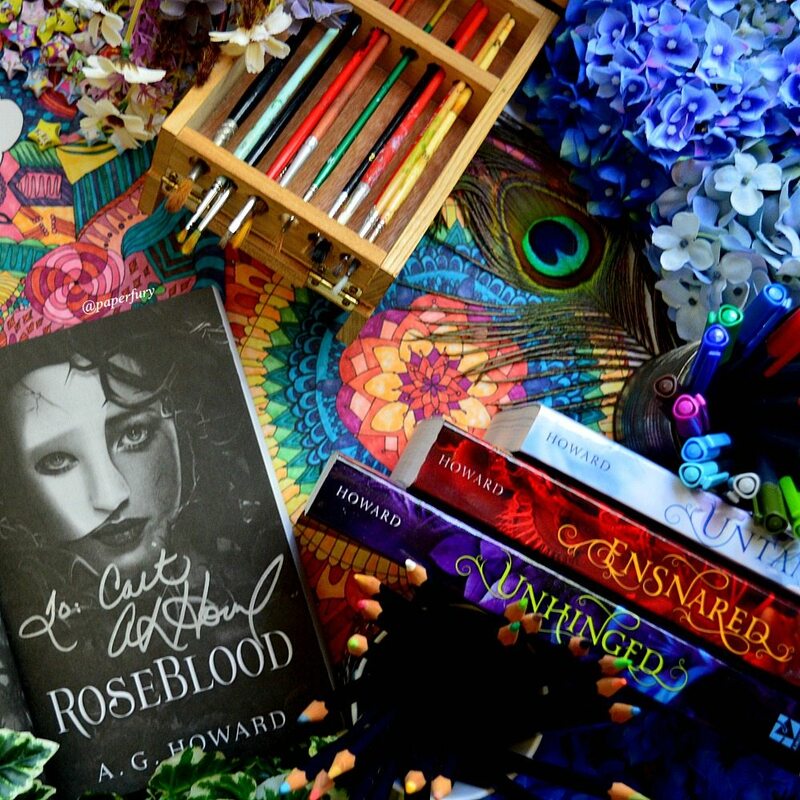 But omg I want to read ALL the A. G. Howard retellings now!! And as for your giveaway, I did actually start singing it 😉 Ask my sister (she told me to shut up). I’m so, so glad you loved this book so much! I enjoyed Splintered even if the world was a teeny tiny bit crazy and it took me some getting used to, I’m definitely in awe of the author’s talent to create magical worlds, and this makes me SO eager to get my hands on that one. Also, you’re SO lucky you got to interview the author, SO JEALOUS – but so THRILLED as well because I love the questions you asked. Her ideas of other retellings ARE AWESOME. YAS THIS AUTHOR HAS ALL THE TALENT OMG. And I really like how she keeps the essence of the original story but also does crazy dark magical twists!?? LURVE. And fajdsklad AG Howard is just the nicest human of ever and I’m absolutely flailing out of my skull to have gotten to ask some questions!! International giveaway? Man, should have been better if aussie only . then I have a better chance of winning. Defo wanna win this cuz it’s on my TBR! PS: how do you check if I had sang that song, I don’t even know how to sing it. I have dastardly mind reading powers and spies. I WILL KNOW. Lovely review Cait! And I have never seen the musical, although I want to! 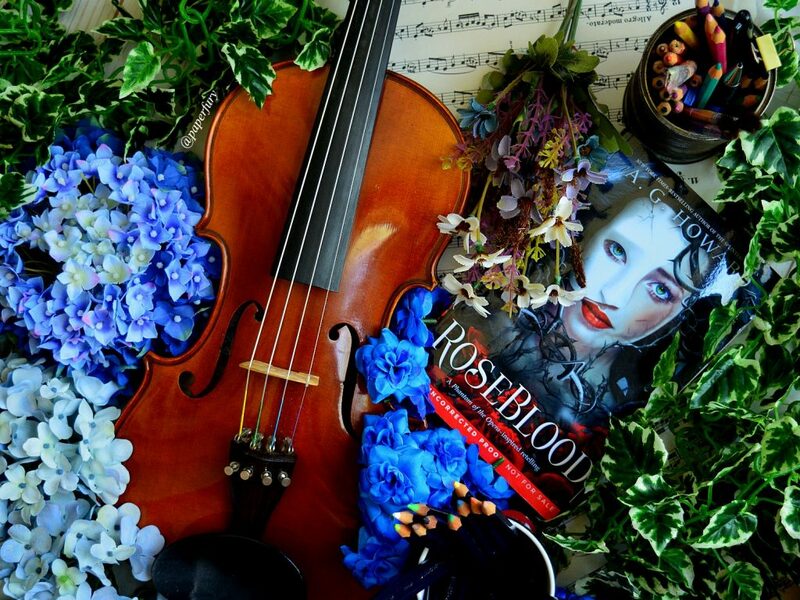 AND I AM SO EXCITED FOR ROSEBLOOD OH MY GOSH! I can’t wait to get my hands on it when it comes out! I loooove the movie, but I haven’t actually seen the onstage musical version.😂 BUT I HOPE YOU LOVE IT WHEN YOU TRY IT TOO!! I LOVE THE MOVIE THE MOST AND BEST. <3 N'awww, but you're too nice!! 😉 I hope you get to read it soon! I saw Phantom of the Opera at the theatre when I was a child. It was so scarey! Looking forward to Roseblood. That’s so awesome you saw it live though!! LUCKY. I love rewrites, modern day retellings, etc. of old stories and this one definitely catches my eye (I never could get my hands on the Splintered series). And it definitely sounds like book that would do well with my students. The description makes it sound that it could be overly dramatic. Is it less “dramaz” and more atmosphere and tension, or am I going to want to strangle a character and tell them to shut up and listen? Which would bother me as a reader and wouldn’t phase most of my HS students. I’ve made this argument before and a student asked me, “What teenager listens?” We’ve chalked it up to the fact that I’m old and impatient. Erm, I have no idea.😂 I loved it and didn’t think it was angsty! I so much love Phantom of the Opera, and yeeeees Phantom by Susan Kay is awesome! I wasn’t planning on reading this book. The cover isn’t appealing to me and it just wasn’t calling for me. BUT. I read your review. And now I really REALLY want to read it! Argh! My TBR doesn’t thank you, but I do! I’m definitely a fan of the Phantom of the Opera, and it’s on my list of plays to see. The songs are some of my favorite too, and I love singing them, particularly All I Ask of You. I’m soooo looking forward to reading this book! Yay! Good for you Cait! *Enters giveaway* Thanks! But OH MY GOSH a modern retelling and YOU HAVE THE AUTHOR HERSELF AND AAAAAAAAHHHHHH. SO MUCH AMAZING AND CREEPY AND DARK MAGIC AND YEEEEEEEEES. Oooh, I do want to read the actual book! I’m kind of ashamed I haven’t yet?!? But it’s on my to-do list officially…I’ll just pretend I’m not terrified of classics haha. OH GOOD. I WAS HOPING THAT WOULD CAPTURE SOMEONE’S ATTENTION.😂 Because honestly TSS is just the most beautiful amazing book in the existence of ever and *SHRIEKS FROM THE ROOFTOPS* I love it.😍 I’m trying to get my little sister to read it, but she reads slower than a tortoise in peanut butter. And I still think this would make sense if you didn’t know the original POTO story!! SO THAT’S GOOD NEWS. Lol!!! I KNOW! My sister is like that too!!! It’s been like 3 years since she read The Lightning Thief and she STILL HASN’T FINISHED THE SERIES!!! No harassment will make her go faster. Also, she is dawdling through this other series over the course of six monthes (and has only read 2/5) that I seriously read in 4 days AND I’M JUST DYING. WHO READS THAT SLOW. I WILL HAVE A HERMIT’S BEARD AND 900 GREAT-GRANDCHILDREN BEFORE YOU’VE FINISHED, SMOL CUCUMBER, SO PLEASE SAVE ME AND GO. JUST. A. LITTLE. FASTER. PLEASE?! I don’t really know the story of the Phantom of the Opera, but this book does sound interesting. I think I vaguely remember a group trying to reenact some parts of the play for English once. I had know idea what was going on and barely remember it though. Cool, I’m highly considering reading it some time in the future. 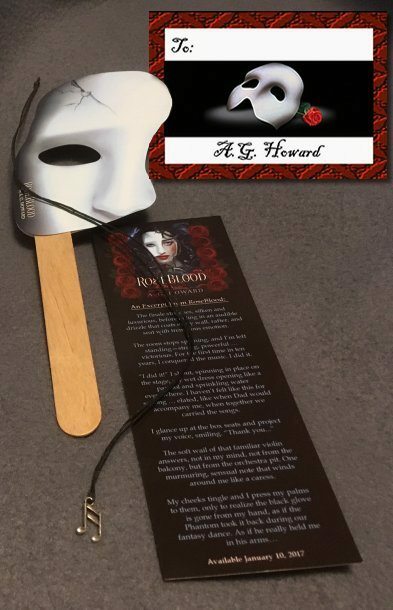 I’ve actually never seen Phantom, but it doesn’t matter because I am a big AG Howard fan! 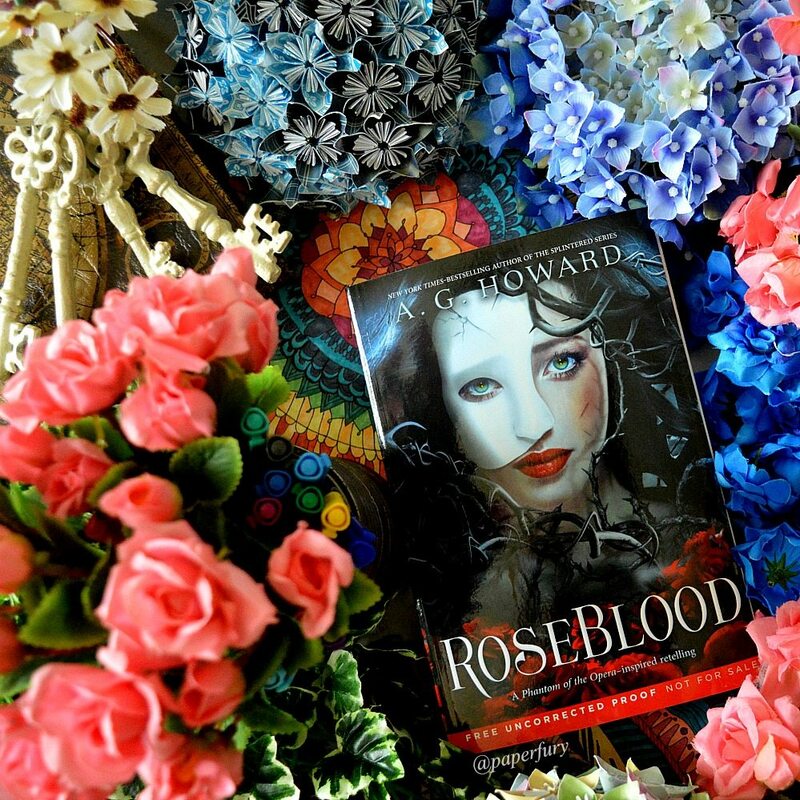 And I’m very excited to read Roseblood!! YAY FOR AG HOWARD FANS. *hi fives* And I think the book would still make sense without having read/seen any other POTO things! I’ve seen the Phantom movie and I love it! I love the music as well! Excited for this book!! EEEP THIS IS AWESOME. I hope you enjoy it if you get a chance to read it! Very exciting! Doing a Q&A must’ve been great. I’ve been thinking of doing one with a less-known author, cause they might agree to go with my lesser-known blog xD but haven’t done anything of the sort yet. Hey, do you still play piano? I mean, do you find the time xD I barely do T_T books have taken the first seat. Ah no I don’t really play music anymore. I do wish I did??? But I also have zero time. I hope you like Roseblood if you try it! TBH, I don’t know what I would even ask and what author I would pick 😀 you know how sometimes an idea is so remote from ever being possible to you in your head that you can’t even picture it ever happening? It’s like that 😀 clearly, I need to acquaint myself with this possibility more in my head now that I’m a book blogger. I wish I played music too, still. Time and motivation. Meh. I can’t BELIEVE that you actually got to interview Anita! That’s just sooo awesome! This book looks incredible; I have to read it!!! And so great you got to interview the author! Aaaaaaaaaaaggggggggghhhhhhhhhhhhhhhhhhhh!!!¡!!!!!!!!!!!!!!!!!!! THIS BOOK SOUNDS SO AWESOME AND COOL AND CREEPY AND COOL AND AWESOME AND DID I MENTION AWESOME AND COOL???????????????????? WHAT EVEN AM I DOING WITH MY LIFE, WHY AM I NOT READING THIS NOOOOOOWWWW?!?!?!?!?!?!?!?!?!?!?!? Oh, and thinking of awesome books I need to get my talons- er, hands on, IS YOUR BOOK THAT YOU WROTE A WHILE AGO THAT HAD THAT BOY AND…. I THINK THERE WAS A HOUSE WITH YELLOW IN IT…. AND A LARGE FAMILY AND YOU SAID IT WAS GOING TO BE HAPPY-ISH OR SOMETHING LIKE THAT (I AM SO ASHAMED I CAN’T REMEMBER PRECISE DETAILS! AND I CALL MYSELF A FURY MINION?!?!?!?!?!?!?!?!?! *DISTANT WAILING AND GRINDING OF TEETH*) BUT THE POINT IS, MY OFFER OF ALPHA, BETA OR EVEN ZETA READER STILL STANDS AND OH MY GOSH OH MYGOSH OHMYGOSH THERE ARE TOO MANY AMAZING AND FANTASTIC AND BRILLIANT AND FANTILIANT BOOKS I NEED TO READ RIGHT NOOOOOOWWWWWWW!!!!!!!!!!!!!!!!!!!!!!!!!!!!! But seriously, this book and your book and so many other books I need to read before they fall on me and I die a sad amazingness0-deprived death by tbr. *cue dramaticly scary and sad music* Though, to be honest, probably the best way to die, right? Anyway, PLEASE KEEP ME UPDATED AS TO WHEN I CAN READ YOUR BOOK!!!!!!!!!!!!!!! YAS I’M SO GLAD YOU LOVE THE SOUND OF IT. You should definitely try it sometime if you get the chance. 😉 Your talons really really want to devour this book mwahah. Haha, that’s totally fine! Actually the happy-yellow-happy book is different from my ghost-book. But pfft, I never even remember what my own books are about half the time so you’re doing fine. 😜 But aww I appreciate that! I’m still editing, but maybe soon I’ll be able to ask for betas?! 🙈🙊 *tackle hugs* You’re too nice to me, E!! YES!!! I forgot to mention (SHAME ON ME) how much I ADORE the Phantom of the Opera!!!!!!!! Yes, I love it, I love music- esspecially violin music- and WORDS IN THE FORM OF A BOOK, so basically there is no possible way in Heaven or Earth that this can go wrong right?? Oh man!! I am so sorry!!! You are so kind to be so forgiving, Majesty!!!! *hyperventilated breathing* What??? DID I READ THAT CORRECTLY?!?!?!?!??!?!?! DID I? DID I??????? *FREAKING OUT* *SCREAMING LIKE A RABID FAN* AKDGAKSDGKAJIUEFKLJASLKFJDLKAJFOIEJLKAGHLKDSJGKLAJAUIOEJKLSADGHKLJGLSKUEIJSKLDJGKLASJD!!!!!!!!!!!!!!!!!!!!!!!!!!!!!!!!!!!!!!!!!!!!!!!!!!!!!!!!!!!!!!!!!!!!!!!!!!!!!!!!!!!!!!!!!!!!!!!!!!!!!!!!!!!! oh, P.S. Too nice????? NO SUCH THING. YOU ARE AMAZING AND YOU DESERVE IT. YAS SO MUCH LOVE FOR THORN. <3 And I loved all the new plot twists and the old. It was just all spectacular and clever right?! YES! It was so awesome! I truly had no idea that it was gothic, can you believe that? I really need to pay more attention! Despite having wanted to read a novel by A.G., I’ve not read any of her novels. Perhaps the one to start with is this. One reason being I’ve not see any ‘Phantom’ re-tellings and this one seems like it’d be a great read! Thanks so much for the review, Cait; so glad you liked this one! Yay!! I’m glad it caught your attention! 😀 🎉🎉Hopefully you enjoy it if you get a chance to read it too!